With chef mastermind Mark Hix pulling the strings here, it's no surprise this place makes the list. Grab a seat along the long bar beneath the massive Damien Hirst installation, and down a couple of the signature Marys all made with Mark's dizzyingly tasty special mix. This ridiculously gorgeous restaurant & bar has a real respect for the Mary. Running with the rule that several is better then just one, it’s rolled out a lineup of four, from the vodka Classic, to the gin-loaded Snapper, to the tequila-laced Maria -- but the star of this show is the Sunshine Mary, made with the ginseng spirit Kamm & Sons and yellow tomato juice. 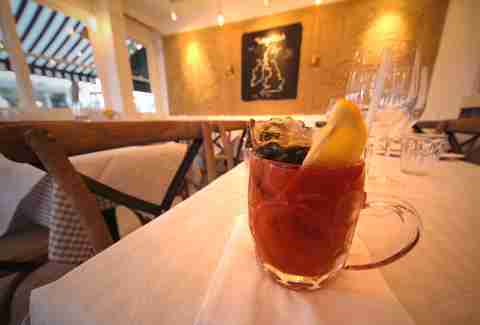 If you happen to find yourself south of the river and in need of a restorative, head to PKD. 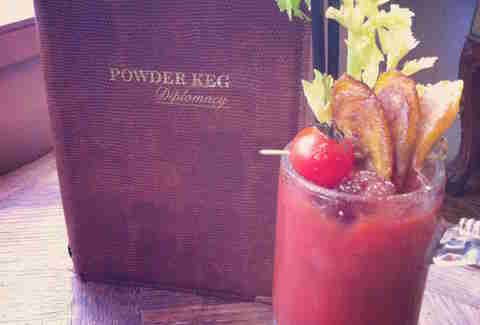 Here you'll find half a dozen Mary variations, including the Bloody Marly with jerk seasoning-infused rums and the Mary Queen of Scots with haggis-infused Monkey Shoulder plus Laphroaig. 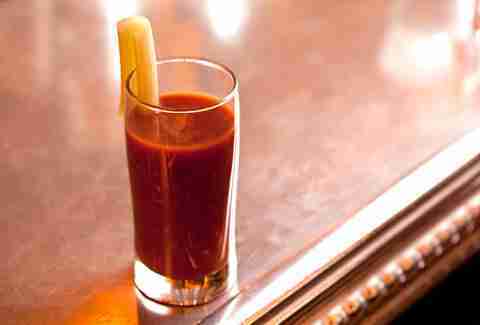 Bloody Marys find their current spiritual home in the brunch culture of NYC, so it’s no surprise that this Big Apple transplant has some pretty excellent ones. Sure, the classic Mary is great, but the Umami Red Snapper has a one-two punch of umami gin plus Plymouth gin to give it a unique, savory taste. 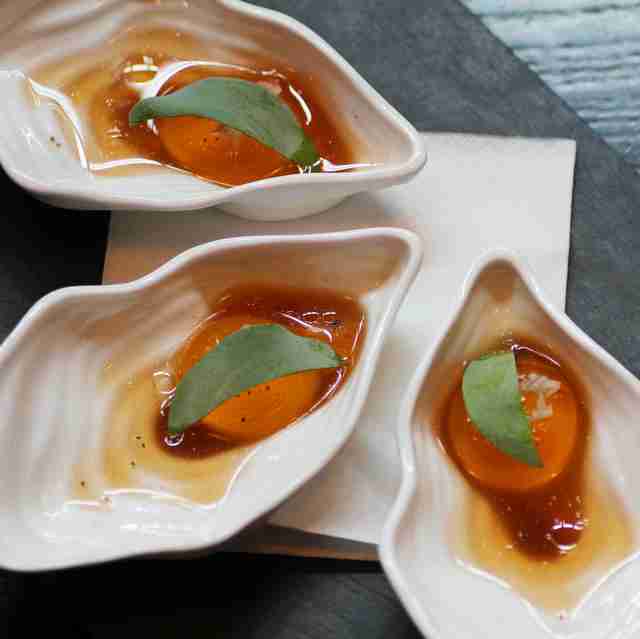 This bite-sized deconstructed Bloody gracefully straddles the line between food and drink. 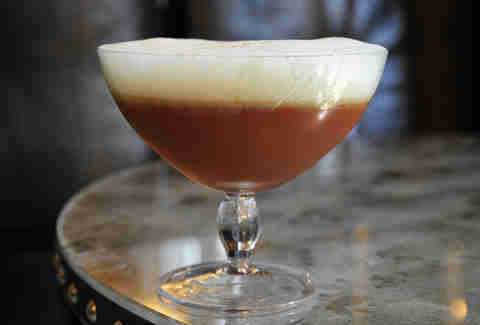 A self-contained bubble of strained tomato juice forms a "yolk," that sits in the white of house-made horseradish vodka. Trust us, it's incredible. This seafood shack likes to do simple things, but to a higher standard. 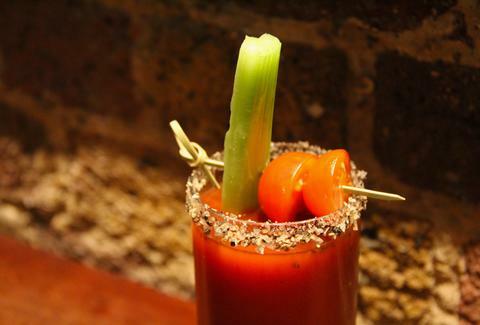 Not just content to let you wash down its crustaceans with standard Bloody Marys, it went next-level and made a house Clamato juice (making this really more of a Bloody Caesar), loaded it with vodka & spices, then topped the whole thing off with an oyster to chase. 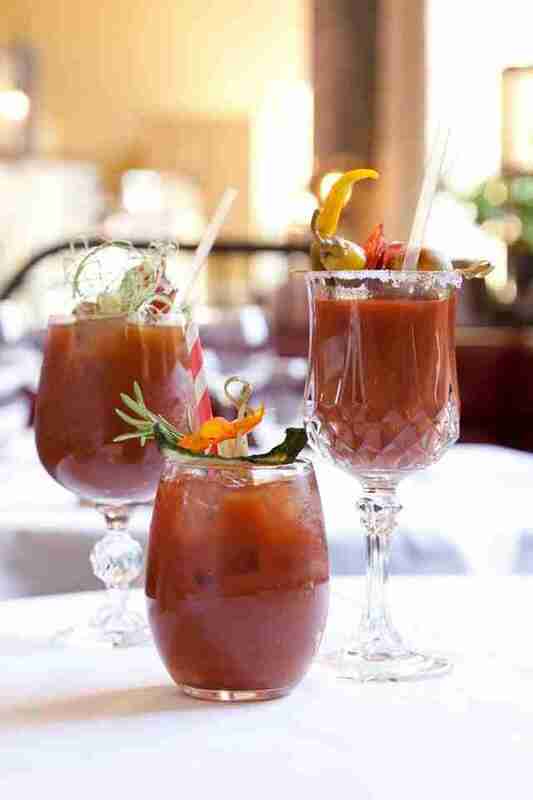 This award-winning Bloody -- the Mezcallywagg -- is pumped full of delicious mezcal, peppercorn-infused tequila, lemon, thyme syrup, charred red pepper, spices, tomato juice, and a Laphroaig spray. Oh, and the bar itself is hidden in a Breakfast Club, so if you truly are hungover, you might want to make a pit stop there first. More dignified then just a pint of sanity restorer, this elegant number is served in a damn chalice with celery foam and a unique mix of spices. While it traditionally comes with vodka, this place is more than happy to play into different spirits, so get busy with tequila, gin, or whatever catches your fancy. It’s a drink The Connaught spot take a lot of pride in -- ask the head mixologist, Ago Perrone, about the development, it's a great listen. 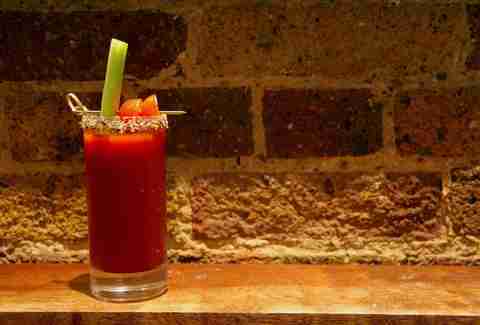 It’s always nice to see a restaurant understand that sometimes a Bloody Mary is close to a religious experience. 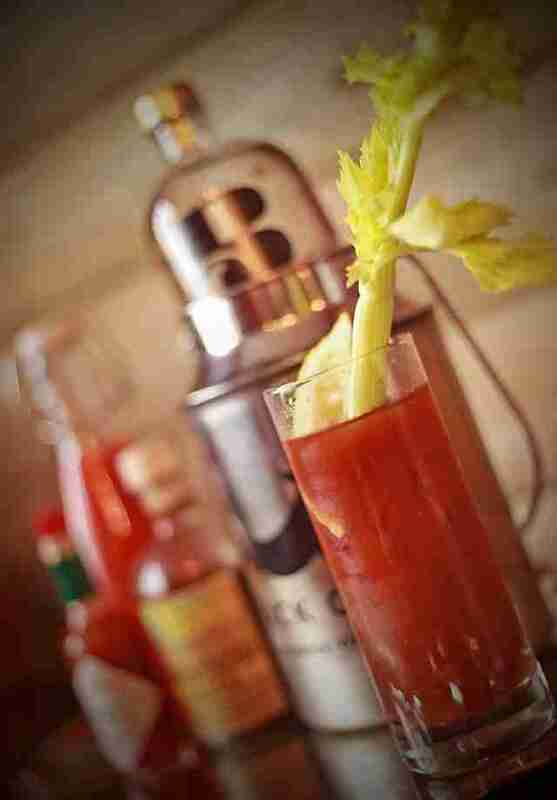 The five “Hail Marys” include the standout Bloody Bull, made with beef stock and spicy beef jerky. These guys pretty much win at everything they touch: meat, hospitality, and, naturally, cocktails. There are several variations, depending on which location you’re at (or even which bartender you get), but the classic you’ll find at all of them is pretty much the dictionary definition of a perfect Mary. Haley Forest is a London writer who thinks going without a Mary is a bloody shame. Follow her at @HCForest.